Born: 28 April 1853, Gwennep, Cornwall, England. 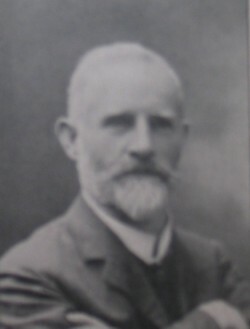 James Thomas was educated in England and described his qualifications as "Honours practical chemistry" (South African who's who, 1908). In 1878 he married Johanna Johns, with whom he had four children. He came to the South African Republic (Transvaal) in 1896. During the Anglo-Boer War (1899-1902) he served in the regimental police and was awarded the South African War Medal with three clasps. During the War, in November 1900, he entered the civil service of the newly created Transvaal Colony and on 1 June the next year was appointed assistant inspector of explosives in the Mines Department. He still held this position in 1906, but by 1908 appears to have succeeded Major Denny as inspector of explosives. He became a member of the Chemical, Metallurgical and Mining Society of South Africa in 1902 and contributed two papers to its Journal: "Notes on the safety fuse; its manufacture, testing and use" (1904/5, Vol. 5) and "Testing of safety fuse by X-rays" (1908, Vol. 9). Thomas's hobbies were photography and poultry and he was a member of the Rand Poultry Club. He was a justice of the peace and resided in Johannesburg at 6 Harley St, Yeoville. One James Thomas became a member of the South African Association of Engineers and Architects in January 1898, but he may have been a different person. Chemical, Metallurgical and Mining Society of South Africa. Proceedings, 1903, Vol. 3, list of members; Journal, 1904/5, Vol. 5, and 1908/9, Vol. 9: list of members and papers by Thomas.